Kate James, The world is a dangerous place (detail). Knitted wool, Pegasus digital print, installation dimensions variable. Photo by Clare James. As far as idiosyncrasy is concerned Kate James from RMIT is in a place all of her own in Hatched05. Her work The World Is A Dangerous Place is explained in her catalogue notes as being inspired by the experience of worry and anxiety and empathy for the anxious animals. We certainly know what she means. Every time we see a disaster movie like The Day After Tomorrow we feel the worst for the animals who can’t escape or don’t know what’s coming (aside from the birds, that is, who always fly away at the last second) and we don’t care about the people who just sit around saying things like “I don’t care if that volcano is gonna blow, this is my home” and then get covered in lava. Stupid, stupid humans. There’s no pathos like pathos in the animal kingdom. 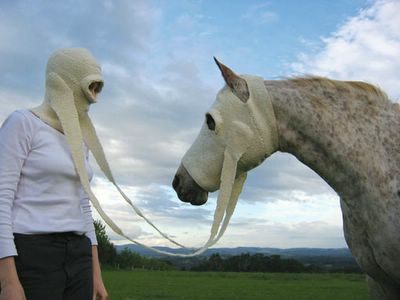 James’s knitted wool balaclava and horse-mounted equivalent allows for human animal interaction on an intimate scale. How the horse feels about the deal, we don’t know, or what would happen when it went off fleeing the lava, but for the moment the photograph was taken, it was a rare moment of inter-species empathy.